It started with a custard pie and went on to become a 13-year, £25,000 obsession for one 43-year-old man from County Durham. And now school caretaker Shaun Hope is taking his interest to a new level by organising a campaign to see children's comedy duo the Chuckle Brothers return to the small screen. Mr Hope, from Willington, first met the pair in 2001, when he volunteered to go up on stage. "I was at the panto with the school trip and they asked for some dads to go on stage. "One of the teachers pushed me forward. The Chuckle Brothers slapped a pie in my face and that was that. I've been a fan ever since," he said. If the duo from Rotherham have put their name or face on it, it can most likely be found in the spare bedroom of Shaun's County Durham home. "I think kids of today are really missing out by not being able to see ChuckleVision," he said. "It was good, clean fun for all the family, a real Laurel and Hardy type show, even if you didn't like them you still laughed." More than 5,000 people have signed his online petition and almost 200,000 are fans of the Chuckle Brothers' Facebook page, now managed by Shaun and the son of Paul 'Chuckle' Elliott. 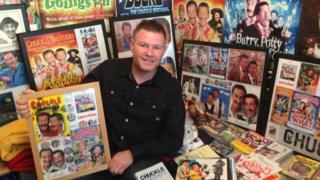 His collection, which he acknowledges as being "a bit daft", contains more than 2,000 Chuckle Brothers-related artefacts. From tour posters and hand bills to scripts, DVDs and baseball caps, Shaun has amassed a veritable museum dedicated to the duo - including the Chuckle I number plate from their pedal-powered cart. With the brothers regularly touring, there is still plenty to collect. "They do a summer show every year which is usually a parody of a film, and then of course they are in the panto over winter," said Mr Hope. "I will never stop, I know it's a bit daft but I love it and I really like getting new stuff to add to the collection, I don't think I will ever have enough." But would he sell his collection for £1m? "Well you've got to be sensible haven't you? With that sort of money you could start a really good Crankies' collection." Asked what they thought of their superfan, Barry and Paul Chuckle said: "Shaun really is a very nice chap. "We have a very special place in our hearts for all our fans but the ones who go the extra mile get Chuckle points and what do Chuckle points make? Laughter and happiness. "There are wonderful fans all over the country. The most-asked question we always receive is 'why isn't ChuckleVision on TV?'" But perhaps most excitingly of all for him, Mr Hope has also often become a part of his idols' show. "They always ask for three dads to go up at the end. If they don't get enough volunteers I go for it. They must have hit me in the face with pies at least 30 or 40 times by now. "I can't wait for their next show."